Putney Bridge is a bridge crossing of the River Thames in west London, linking Putney on the south side with Fulham to the north. The bridge has medieval parish churches at each end. In its first guise, from 1729 to 1886 it was slightly down river to the north, and in many official records was also known as Fulham Bridge. The current format is three lanes southbound (including one bus lane) and one lane (including cycle lane/bus stop) northbound. Putney High Street, a main approach, is the main axis of a very commercial district centre. The north side of the bridge is 120m WSW of Putney Bridge tube station, which is in the park-sandwiched Hurlingham neighbourhood of Fulham. Parkland to the west includes the gardens of Fulham Palace, historic home of the Bishops of London. The south side of the bridge has next to its church, a rounded glass-prowed ship-shaped 21st century building, Putney Wharf Tower, one of the tallest buildings in Putney. One story runs that "in 1720 Sir Kingston on Thames and being in a hurry to get to the House of Commons rode together with his servant to Putney to take the ferry across to Fulham. The ferry boat was on the opposite side, however and the waterman, who was drinking in the Swan, ignored the calls of Sir Robert and his servant and they were obliged to take another route." Walpole vowed that a bridge would replace the ferry. 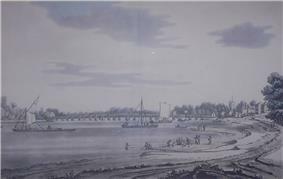 The legal framework for construction of a bridge was approved by an Act of Parliament (the Fulham and Putney Bridge Act) in 1726. Built by local master carpenter Thomas Phillips to a design by architect Sir Jacob Acworth, the first bridge was opened in November 1729. It was the only bridge between London Bridge and Kingston Bridge at the time. A toll bridge, it had tollbooths at either end of the timber-built structure. In October 1795, Mary Wollstonecraft, philosopher and early women's equality advocate, allegedly planned to commit suicide by jumping from the bridge, because she had returned from a trip to Sweden to discover that her lover was involved with an actress from London. The bridge has been the starting point for The Boat Race since 1845 when the course was revised. The competitors are currently 32 men of Oxford and University of Cambridge with two crews of first and second eights. Women's eights will compete this for the first time in 2015, having since 1927 competed a shorter varsity race in Henley also in the early spring. The bridge was badly damaged by the collision of a river barge in 1870. Although part of the bridge was subsequently replaced, soon the entire bridge would be demolished. In 1886 construction of the stone bridge that stands today, on a new alignment, was completed. A new road - Putney Bridge Approach - was laid to connect the northern end of the new bridge with Fulham High Street at its junction with New King's Road: in consequence the southernmost stretch of Fulham High Street was reduced to a cul-de-sac. The Metropolitan Board of Works purchased the bridge in 1879, discontinued the tolls in 1880, and set about its replacement. The current bridge was designed by civil engineer Sir Joseph Bazalgette as a five-span structure, built of stone and Cornish granite. Bazalgette also designed London's sewerage system, and the bridge integrates two of his five outfall sewers running perpendicular to it. It was constructed by John Waddell of Edinburgh, whose tender of £240,433 (equivalent to £21,627,638 in 2016) was accepted on 15 April 1882. It is 700 ft long (210 m) and 43 ft wide (13 m), and was opened by the Prince (later King Edward VII) and Princess of Wales on 29 May 1886. In 1933, the bridge was widened to its present three carriageways. Putney Bridge Approach was widened in consequence, further encroaching on the churchyard of All Saints Church, Fulham. Putney Bridge is the only bridge in Britain to have a church at both ends: St. Mary's Church, Putney is located on the south and All Saints Church, Fulham on the north bank. The stone marking the downstream end of the Championship Course is used for all boat races through Putney in olympic class rowing boats. These include the Wingfield Sculls and the UK's main Head of the River Races, just west of the bridge, rather than at the bridge itself, under which the centre of its middle arch would provide an advantage if starting underneath it, as all races are competed with the tide. Putney Bridge is often very busy on Saturdays when Fulham F.C. are playing at home as this is the main way for fans to cross the river. In March 1953, British serial killer and necrophiliac John Christie was arrested on Putney Bridge. In 2007, the Grade 2 listed structure suffered considerable damage by a developer who cut several holes into the Cornish granite of the southern approach of the bridge. On 14 July 2014, Putney Bridge closed for three months, except to pedestrians and dismounted cyclists, to undergo "essential repairs" by Wandsworth Council "to better protect the bridge from damage caused by water penetration, which has contributed to the poor road surface". The bridge reopened on 26 September 2014. In the final scene of the 1998 movie Lock, Stock and Two Smoking Barrels, Tom is on Battersea Bridge NOT Putney Bridge and about to throw two very valuable shotguns in the river, while his friends try to call him. ^ "Women's Boat Race set for men's course from 2015". BBC. 7 February 2012. Retrieved 10 April 2012. ^ "Injunction stops Putney Bridge drilling". ^ "Getting around while Putney Bridge is closed".